Meeting the growing demand for urban living in the heart of the city, Juhl, a 344-residence loft-style community that spans an entire city block in downtown Las Vegas, is now open for sales. Known for its flexible floor plans, industrial chic design aesthetic and art-inspired living, this urban destination boasts 20,000 square feet of specially curated ground-level retail that complements the neighborhood’s existing retail, seamlessly connecting downtown districts, including the Arts District, from which it draws significant inspiration. A popular residential choice for professionals and entrepreneurs, especially many who work at firms and courthouses throughout downtown’s expansive legal community, Juhl encompasses multiple buildings, including a high-rise, a mid-rise, brownstones, live-work spaces, retail spaces and a warehouse-style loft building. The first phase consists primarily of studios and one-bedroom condominiums. In total, Juhl offers a remarkable and impressive 130 unique floor plan configurations that are one of a kind. Homes at Juhl range from 600 square feet to just under 2,000 square feet and are priced from the high $100,000s. Recently refreshed, Juhl boasts a redesigned resort-style pool with cabanas, a spa, a fire pit, a summer kitchen with grills called “Canvas Grill” and a co-op working lounge that caters to its residents. Hallmarks of Juhl include flexible floor plans, large terraces and floor-to-ceiling windows that maximize natural light. Private balconies, 10-foot ceilings, energy-efficient design and details, exposed concrete surfaces and mechanicals and upgraded fixtures and surfaces all combine to create Juhl’s cool, urban vibe. Amenities include an al fresco screening room; a two-story fitness center with a pool and Strip views; a 10th-floor wine patio; a full-service concierge; 24-hour security; and a gated parking structure with assigned resident parking. Juhl also has its own lifestyle director who creates social events and experiences for residents to meet their neighbors in casual, relaxed and fun settings. And a nearby Urban Garden plot exclusively for use by Juhl residents makes urban gardening possible for those wishing to grow their own fresh herbs and vegetables. According to Uri Vaknin, a partner at KRE Capital LLC, Juhl is home to scores of professionals who are drawn to the downtown lifestyle and the urban contemporary aesthetic of the property. KRE Capital, in partnership with Dune Real Estate Partners and Northcap, purchased Juhl in 2013 as DK Las Vegas. 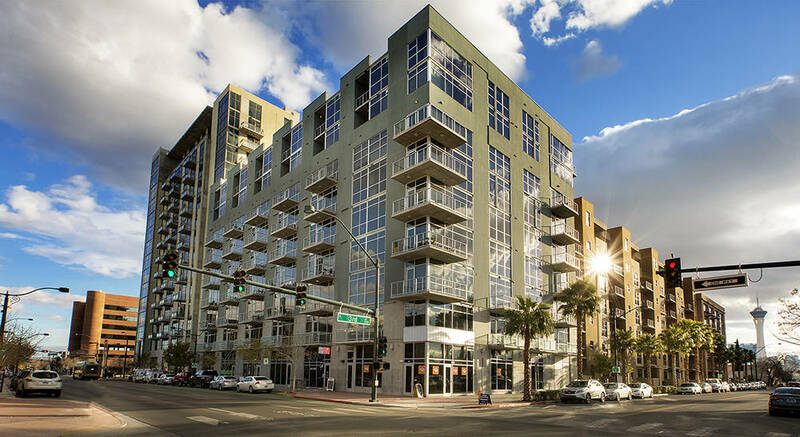 “Juhl is situated between the Arts District and Fremont East Entertainment District, so its location, along with its robust retail offerings, serve to connect areas of downtown and create a more cohesive retail and dining experience,” Vaknin said. The community boasts its own “Artist in Residence” program that currently features local Las Vegan Justin Favela, whose work is showcased in “Tilting the Basin: Contemporary Art of Nevada,” an exhibit that recently ended featuring more than 30 artists living and working across Nevada today. Juhl was a sponsor of the two-month exhibition, which also promoted a future modern art museum in the area. “Interest is strong for those desiring to make Juhl their permanent home, including many who are currently living there as rental residents,” Vaknin continued. “Juhl offers a distinctly urban vibe that is elevated in both design and functionality. Late last year, The Promenade at Juhl opened on the property’s ground level, further enhancing the convenience of living at Juhl and adding to the area’s growing sense of community. Seven of eight planned retail spaces are now open, including several that are owned and operated by Juhl residents embracing the dream of living and working in the same space. Now open at The Promenade at Juhl are Greens &Proteins, a modern, family-friendly cafe with a healthy twist; Le Pho, a popular Vietnamese kitchen; Classic Jewel, a cocktail lounge; The Audio Video Boutique, which specializes in home theater retail and design; Downtown Decor, with eclectic and esoteric home furnishings and decor; JAECI, offering inspirational jewelry; Galerie Miscre8, an urban gallery; Get a Haircut, a classic rock-themed barber shop; and coming soon is The Corner Market.